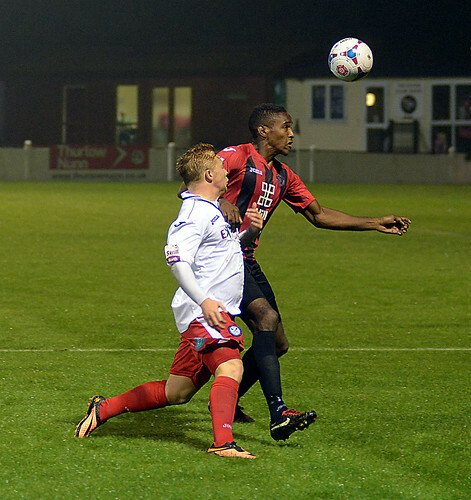 Town Return To Top With Hard Fought Victory .. 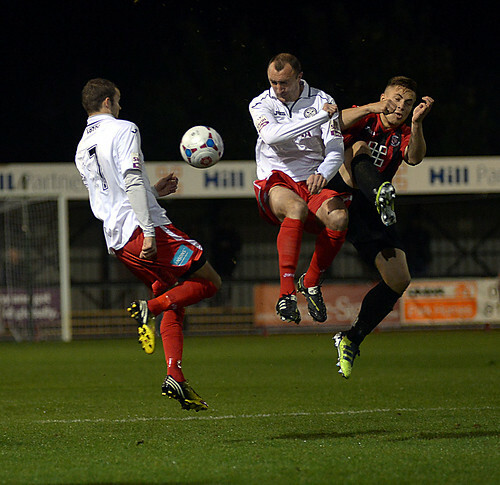 Rob Smith’s Hednesford Town were able to move back to the top of the Skrill North following a gritty 1-0 victory over the ten men of Histon, writes Scott Smith. Town went into the game against their sixth placed opponents knowing that the Cambridgeshire based side were taking a three match unbeaten home run into the match. Meanwhile, Smith put his faith in the same starting XI that had picked up three points against Vauxhall Motors on the previous Saturday. After a pretty even opening period, the game exploded into life in the 15th minute. From a Hednesford corner, the ball eventually found its way to Kris Taylor who saw his goal bound effort cleared off the line. A follow-up shot from Aaron Rey was also cleared off the line by Harry O’Malley, however, this time it was with the use of his hand. 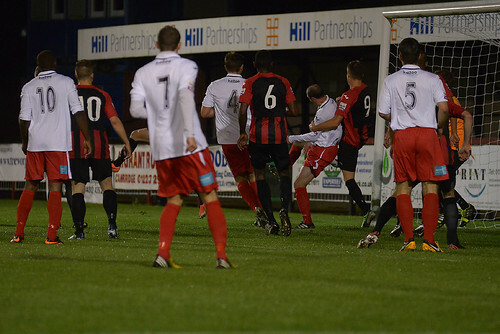 Referee David Rock was on the spot to award a penalty and give O’Malley his marching orders. 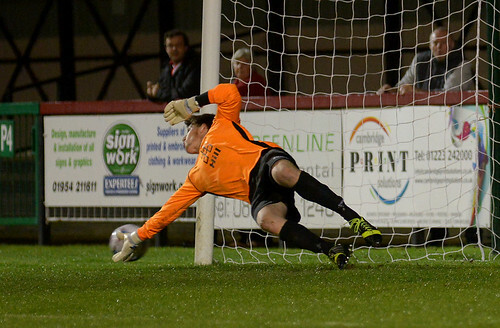 Elliott Durrell duly dispatched the spot-kick into the bottom corner of the net despite the best efforts of Alex Lynch in the Histon goal. Hednesford were now looking to try and make the extra man advantage count with Durrell seeing a goal bound effort blocked, whilst Neil Harvey fired wide at the near post following a neat move. Despite having ten men, the home side pushed forward in search of an equaliser and they nearly found it in the 48th minute when Kaine Sheppard spun his marker and hit an unstoppable shot against the bar. This was a warning to the visitors and Town almost relieved some of the pressure when Durrell and Darren Campion both squandered good chances to find the back of the net from inside the penalty area. But back came the home side and Hednesford were indebted to John Disney in the 70th minute as he somehow cleared the ball off the line when it looked certain to find the back of the net. 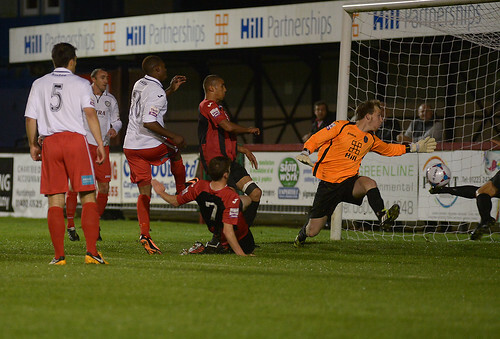 This would be the closest that Histon would come to an equaliser though, as although they had a number of half chances, Dan Crane was never really tested in the Hednesford goal, with the hosts’ shooting wayward at best. Meanwhile at the other end, substitute Charlie Anagho-Ntamark could have wrapped up all three points for Town late on as he first fired into the side netting before later being denied by home goalkeeper Lynch. In the end though, the early penalty would be enough to seal all three points for The Pitmen as they head into Saturday’s game at Guiseley knowing they sit top of the pack following another excellent victory on the road.